We have the most amazing local interactive museum that opened earlier this summer called the Museum of Natural Curiosity. 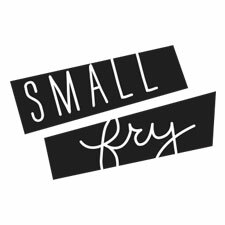 We took a tour for their grand opening and the boys talked about it for weeks afterward! We kept hearing that it was packed with excited kids the rest of the summer, so we avoided going even though we were being begged often. Now that school is back in session, we were itching to go again during regular elementary school hours to get another peek with less chaos. 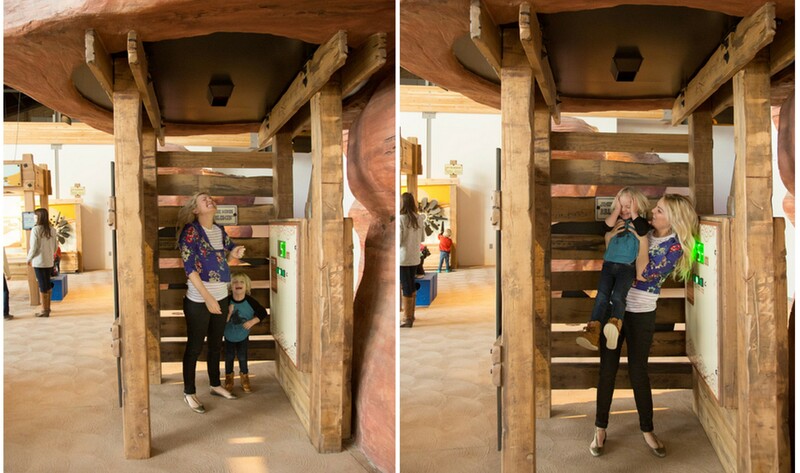 Every square inch of the museum is something educational and interactive, and almost all of the exhibitions are about nature. So on the way up to the museum, we pulled out our boys’ favorite DIYs to prep them for a day of learning! First up, the Cloud Guide! With our trusty cookie sheet, this DIY works awesome even on the go! 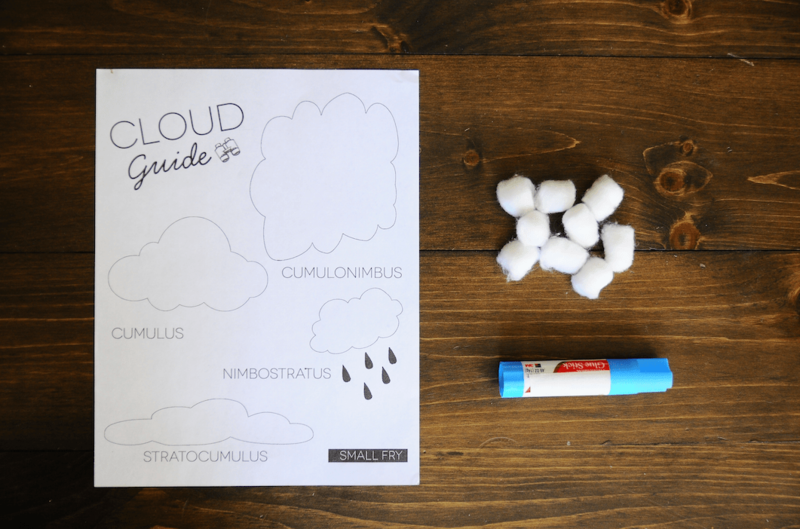 Just grab a bag of cotton balls, a glue stick, and the printable (download below!) 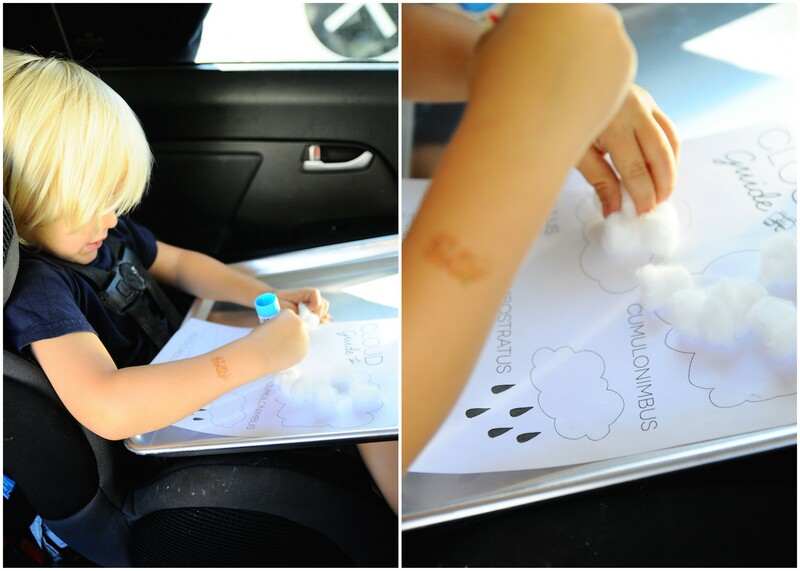 Then glue right onto the paper and stick the cotton balls on accordingly! Cumulus: the “fair weather” cloud. Puffy cotton-ball looking clouds, which sometimes appear with flat bottoms, are a sign of good weather! Cumulonimbus: a vertically built cloud that usually brings lighting, storms and blizzards in the Winter! Nimbostratus: the rain cloud! Gray and and cotton candy like, these carry rain wherever they go. Stratocumulus: another dark gray cloud that travels in bunches. It usually comes at the beginning of a storm and is the “sprinkle” cloud, where you’ll only feel little droplets of water. Hayes loved putting this together and after talking about each cloud, he absolutely lit up each time we were able to point one out through the window. This DIY made him even that much more excited to get to the museum, if that was possible! There are several weather-related exhibits there, so we talked about how the skies can tell us a lot about what to expect each day to tie it all together. Seeing them make those connections is always so rewarding as a parent, isn’t it? Grab an empty paper towel or wrapping paper tube and cover it with tape! 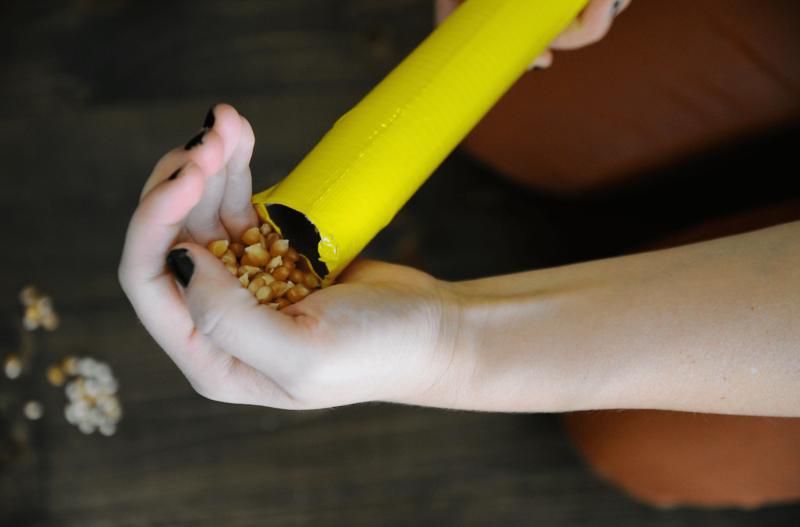 Before closing off the top, fill it with rice for a sprinkle, popcorn kernels for a Spring shower, and marbles for a serious storm. 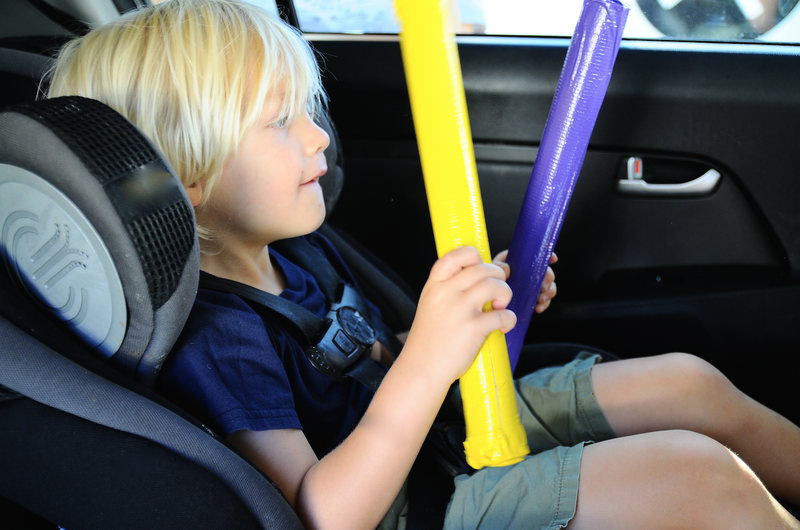 For thunder, simply clap the two sticks together … the boys love this part. After touring the exhibits about windstorms, earthquakes and a feature all about flooding, Hayes was anxiously checking out the museum windows to see what the sky had in store for us! He was disappointed to see nothing but blue skies upon our exit, so needless to say we had a lot of fun making our own rainstorm in the car on the way home! These two crafts are household favorites of ours and really get curiosity peeked about the weather. It makes for great conversation and great observation while we’re on the road! The Museum of Natural Curiosity serves up so much inspiration every time we go there. 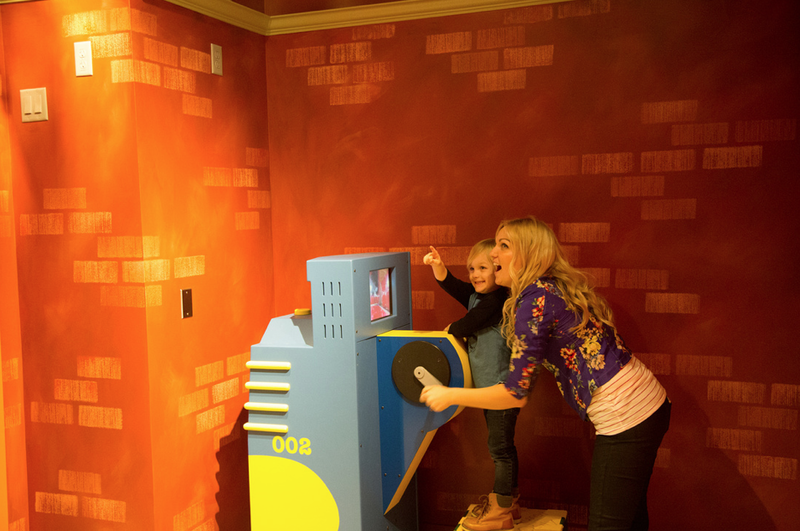 Here are some of our favorite exhibits! Photos by Alyssa Vincent. The Wind Tunnel! You can experience up to 75 mph winds in this one. It is always filled with laughter! For music lovers this next one is a definite favorite. 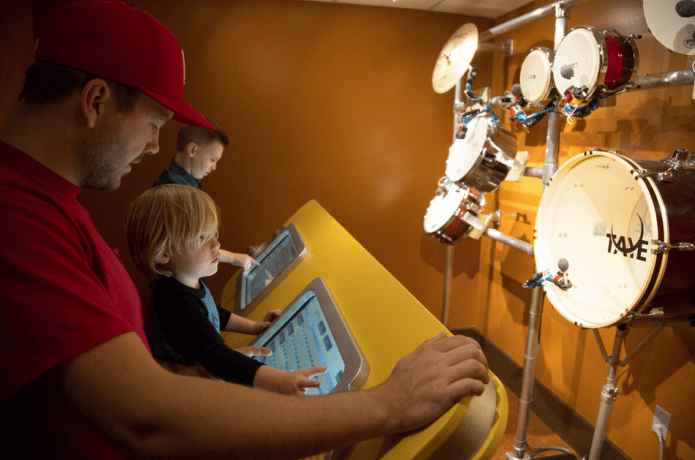 Touch screens control the wall of instruments. You can select what instruments play at which measure, choose meter and frequency and so much more. So cool! Overlooking the Commerce center. Buy and sell, shop and trade. The grocery store kept us all entertained for hours! There’s not only a grocery store but a garden, too! And if you go up even higher you’ll find a stranded airplane. 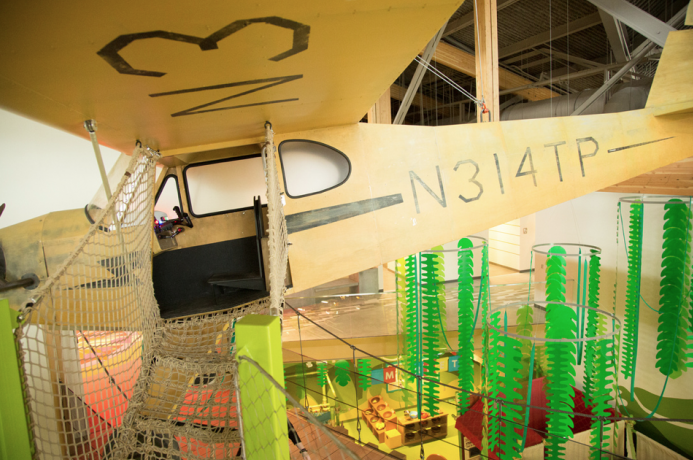 This airplane leads to an ancient Mayan Ruin play place and obstacle course. 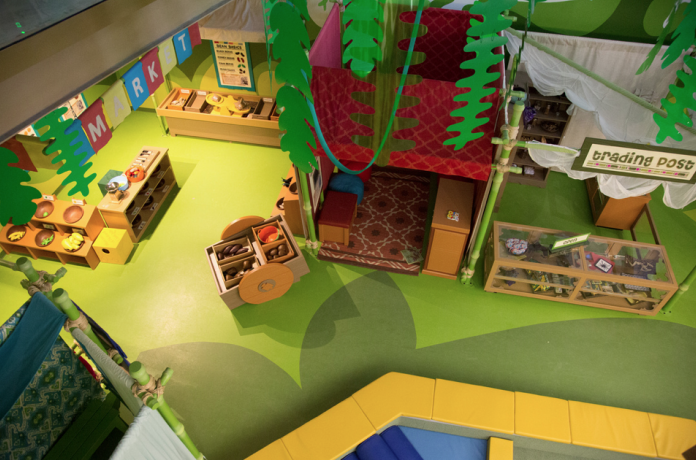 If you locals need a place to really spark some wonder in your family, the Museum of Natural Curiosity is it! Do you have an Interactive museum where you live? What are your family’s favorite stops? I am dying to get to that museum! That is so cute, I have only heard good things about it! Next time we go up north we will stop by for sure!